on the upper East Coast of the North Island, in the beautiful Hauraki Gulf. 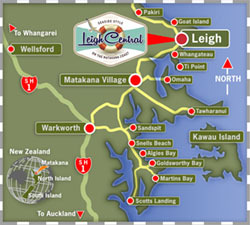 In our immediate neighbourhood we have Leigh Harbour and Matheson’s Bay, Goat Island Marine Reserve and Ti Point. to Little Barrier and Kawau Islands. We are just a one hour drive north of Auckland City. marine reserves, calm estuaries and safe harbours. Take State Highway 1 (Northern Motorway), over the Harbour Bridge following signs to Whangarei. 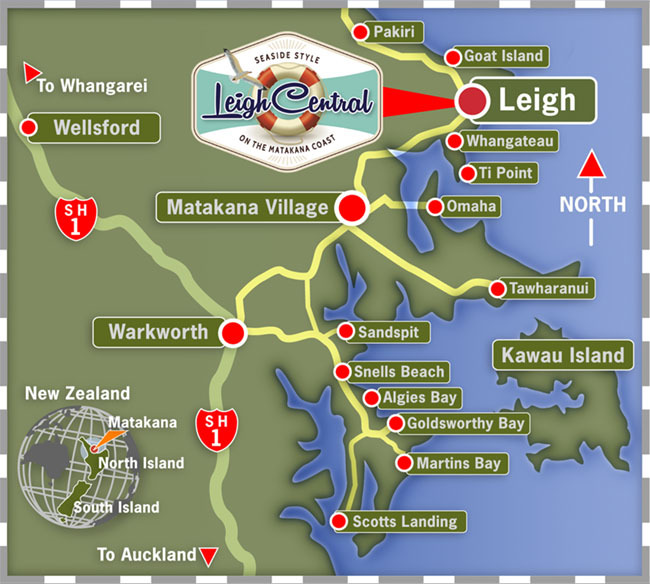 Leigh is approximately 60 kms north and you may travel either via the motorway, part of which includes a Toll Road or the slower coastal scenic route via Orewa, Waiwera, Wenderholm Park and Puhoi. (See also Google map below). Instructions for either route are clearly marked as you travel. Upon reaching the town of Warkworth turn right at the second set of traffic lights following the sign marked Twin Coast Discovery, Warkworth Town Centre & Leigh. Immediately through this (slightly tricky) intersection, veer LEFT and continue to follow the signs to Matakana, Goat Island and Leigh. You will now be 22kms from Leigh. Follow the signs posted and you should now be on Matakana Road heading towards the Matakana Wine Trail and Village. Once in Matakana Village, take the second exit (straight through) at the roundabout, Leigh Road. This also leads to Omaha, Matheson’s Bay, Goat Island Marine Reserve and Pakiri Beach. Travel 12 kms and you will find yourself in Leigh. Leigh Central is on Cumberland Street. Turn right immediately on the corner at the local Store (Leigh Dairy). Drive 20 metres past Leigh Eats and the Leigh Gas Station and you will find our entrance. From Whangarei travel south on State Highway 1 for 100kms to Warkworth. Turn left at the (tricky) intersection at the first set of traffic lights, and keep left following the signs to Matakana and Leigh as per previous instructions. 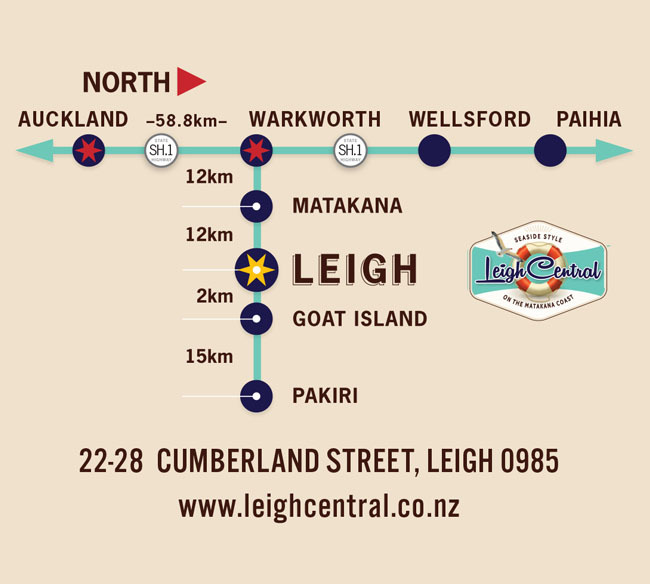 You may also reach Leigh from the north via Pakiri, OR Matakana Valley Road turning left at Wellsford – thus avoiding possible congestion in Warkworth. Although this is a more scenic route, the roads are more challenging to drive and we suggest you consult a map or GPS for directions. Please enjoy your journey, drive safely and give due consideration to our rural environment, its local people, animals and wildlife.